Strawberries are a delicate and relatively expensive fruit but so delicious and rosily pretty they’re hard to resist at this time of year! 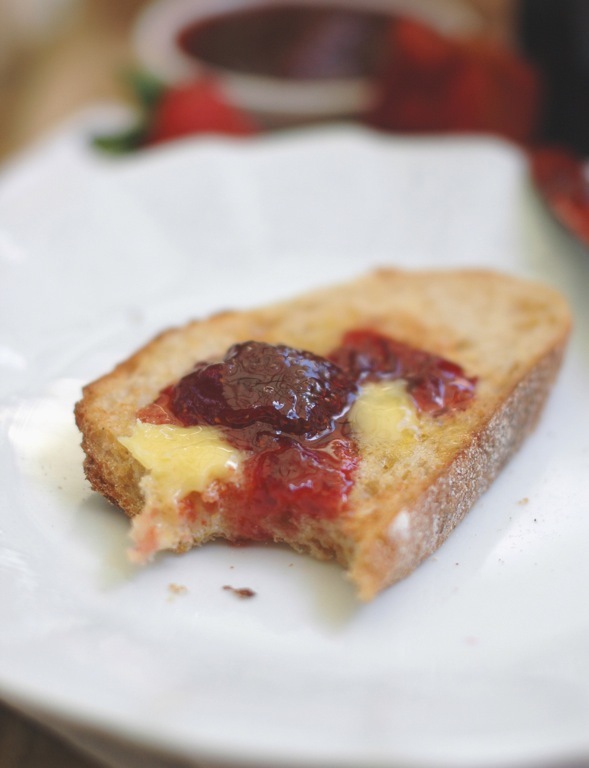 If you ever find yourself with a glut try making your own jam- it’s really very easy if you make a small quantity, and even this recipe is easily halved. Bear in mind that your fruit must be perfect- you need to get those strawberries into the pot before they disintegrate or the jam will be very difficult to set, as over-ripe fruit (particularly strawberries) is low in pectin. In order to preserve fruit jams necessarily contain a lot of sugar. This recipe uses the minimum amount, so don’t be tempted to reduce it, but remember jam is best eaten in moderation… these Spelt & Buckwheat Scones are a good vehicle. The tart addition of lemon in this strawberry jam balances its sweetness and helps it to set, providing a natural form of pectin. 1. 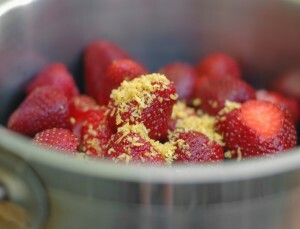 Combine strawberries, lemon juice and zest in a wide stainless steel saucepan (about 15 cm deep). Crush with a potato masher until about half of the berries are crushed. Bring to the boil over high heat and simmer 2 minutes. 2. Meanwhile, gently warm the sugar in a saucepan on a separate burner. 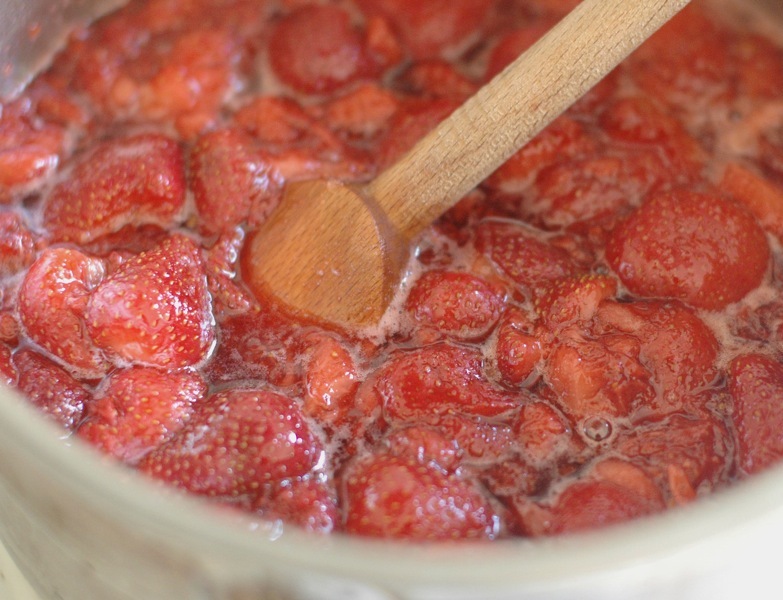 Add sugar to strawberries and stir constantly until it is dissolved. 3. Allow the jam to come back to the boil and cook rapidly, stirring occasionally . You must stay with the jam to ensure it doesn’t boil over or stick. The jam should take about 20 minutes to reach setting point. To test, place a tablespoon of water on a plate and drop in teaspoon of jam: when it gels the jam is set. 4. Skim scum from the surface of the jam. Carefully decant into sterilised* jars and screw on their lids. Label and store in a cool place. After opening store in the fridge. * To sterilise jars (they must have a metal lid), wash everything thoroughly in warm soapy water then place on a tray in a 160°C oven for 15 minutes.